LATE IN 1913 a barefoot figure carrying cross, calabash, and Bible crossed the frontier from Liberia to the Ivory Coast and began the most effective evangelistic crusade in modern African history. His name was William Wade Harris, a native Liberian. 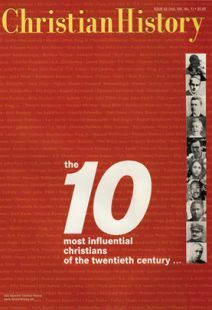 Tens of thousands followed Harris, establishing churches in regions that had never seen a missionary. Harris himself was arrested by French colonial officials, treated roughly, and expelled from the colony in 1915. But his followers persisted, forming congregations that were “discovered” when the missionaries arrived years later. The Christian world in the twentieth century shifted its center south of the equator. This historic transference was largely carried out by African, and Latin American, Christians like Harris. For some, the issues have been more social and political. John Chilembwe, a Baptist convert, established a self-run mission near his home in modern Malawi in 1910. When in 1914 the colonial state began to press-gang Africans into military service, Chilembwe protested: “Let the rich men, bankers, titled men, farmers and landlords go to war and get shot . . . instead the poor Africans are invited to die for a cause that is not their own.” He then called on Christians to fight against their oppressors. Despite his forces’ early successes, colonial militias soon regained control and killed Chilembwe. Still, his memory inspired future nationalists to seek independence in Ghana, Tanzania, and elsewhere. Christianity equally inspired spiritual awakening. Beginning as a small movement in Rwanda in the 1930s, the East African Revival is one of the most important forces shaping Christian life in contemporary Africa. Among its early leaders was the Ugandan Simeoni Nsibambi who, after receiving a vision from God, engaged in intensive Bible study for several days with the Anglican missionary and Keswick revivalist Joe Church. During a convention in 1933–34 at which Church and Nsibambi preached, mass revival broke out. By the late 1940s, revivalists from Uganda were holding mass meetings in Kenya, Tanzania, Uganda, Rwanda, and elsewhere, drawing tens of thousands. This is but a small part of the third-world legacy, which will become even more evident in the twenty-first century as Christianity increasingly becomes a major faith in the southern hemisphere. Derek Peterson is an instructor of history at the University of Minnesota.